Its interior space planning is designed by experienced yachtsman and specified with a Rolls Royce propulsion system reaching top speeds of 38 knots and cruise speed of 35 knots. She is equipped with dual stabilizing gyroscopes and a telescopic and submersible swim platform. This sleek, low profile sport yacht is ideal for people who want to reach destinations fast in whisper quiet comfort. 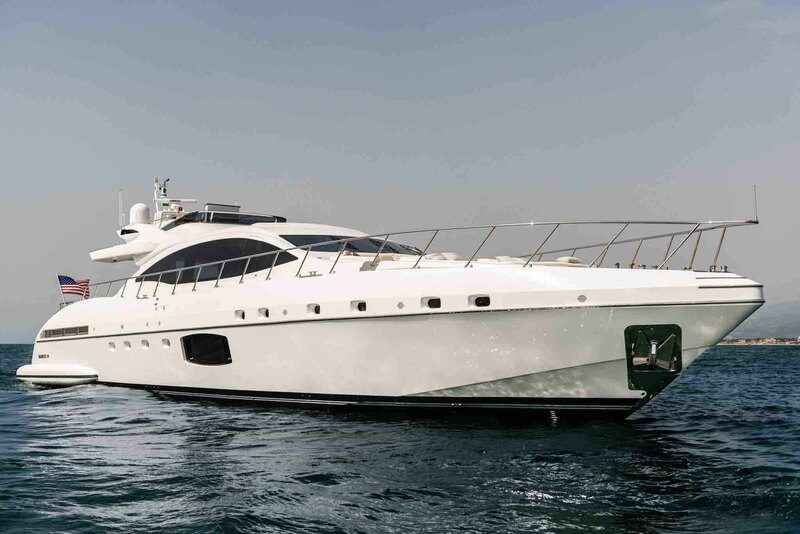 Designed for warm weather use and ideal for prime anchorage spots and islands proximity, the Mangusta 94' is a must have for the fun-loving owner. It is ideal for families with children or adults who entertain for pleasure and business. 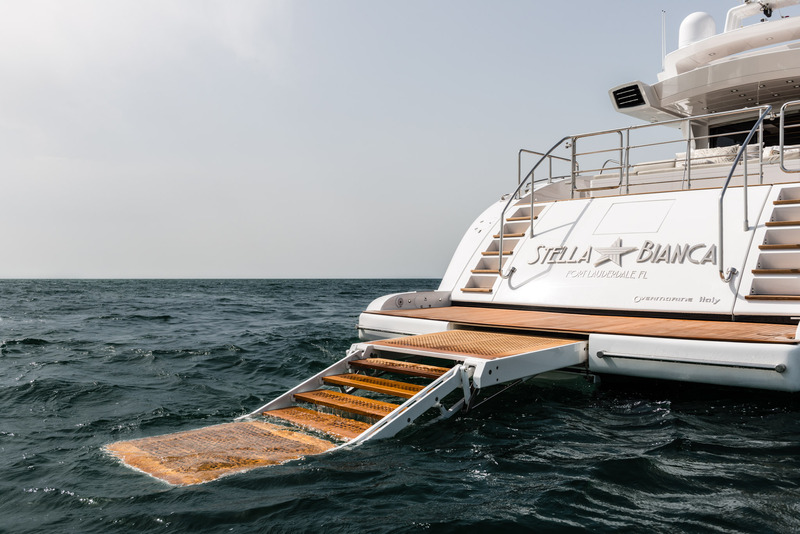 STELLA BIANCA boasts distinctive and unique spaces designed for the multi-use owner which can be turned from full sun to shaded areas in minutes. The Portuguese bow allows for both sunbathing and a covered dining experience for ten. The flybridge is equipped with a driving helm station that also allows for 'private' sunbathing which can also be converted into an entertaining and dining area. The aft deck converts from cocktail to dining with either shaded or open sunpads and can accommodate 15-20 people without feeling overcrowded. The extendable and submersible swim platform is an ideal gathering place for families with children and pets while the European Passarelle also doubles as a diving board. An added portside crew privacy entrance can be used by owners and guests as well to access head facilities preventing wet bathing suit's trudging through the yacht. The aesthetically pleasing interior space was designed for comfort, privacy and functionality. The combination of rich Italian woods, surfaces, hand crafted leather furnishings and blinds and monochromatic color pallet make it easy to be customized with accent colors of your own choosing. The main salon arrangement is large enough to seat 10 people comfortably with a cocktail table that converts easily for dining. It is equipped with high quality china and flatware which sets up in minutes for an evening of elegant dining. The salon is equipped with a full service wet-bar for entertaining, an impressive electronic rise-up lighted liquor cabinet and blue-tooth controlled barista to automatically brew different styles of fresh ground coffee. A 60" VHD television and black-out shades convert the whole salon to a private theater for movie viewing on family night. An opening sunroof that extends the height of the ceiling and aft doors that fully opens assures a pleasurable “outside/inside” yachting experience. The helm station is equipped with state-of-the-art electronics for safety, stability and maneuverability. The newest in electronic environment controls, its Sealux System, allows the entire interior/exterior functions of the yacht, including sound, lighting, blinds, HVAC, to be controlled by iPads that also connect to your iPhone to allow owner and guests to easily adjust their own preferences for environment controls and personal entertaining and listening pleasure. Below deck is specified with three staterooms and a lower salon or 'relax' room that is fully equipped with microwave, refrigerator, icemaker, desk and printer, all ingeniously hidden away in a beautiful design of mixed woods, giving below deck a very spacious, open and airy feel. The VIP stateroom is designed with Queen/King custom size bed, high ceilings, television, his and her closets, lighted make-up vanity and ensuite head. This stateroom can be flooded with daylight through overhead on deck skylights or blacked out for a cozy night sleep it is a five-star suite for your most important guests. The twin stateroom is designed with two twin beds, closet, television and ensuite head that doubles as a day head. This stateroom is ideal for either guests or families with children. The owners master stateroom with King size berth, boasts a full beam and high ceiling, is equipped with 55" VHD TV, his and her lighted closets, lighted make up vanity/desk, sofa, his-and-her heads and oversized, spectacular port lights with underwater lighting for a magical night-time atmosphere. The galley is designed with functionality in mind. It is a truly modern galley finished to the same distinction as the main areas of the yard. Equipped with black 'leather finished' granite countertops and silver gray lacquered wood cabinets giving the galley a futuristic look. The Miele appliances include dishwasher, food warmer, oven, stove top, washer and dryer. The main wine cabinet and icemaker are Sub-Zero and all four ice makers produce clear ice. The four-compartment refrigeration unit can be converted from either refrigerator to freezer depending upon the temperature control. The arrangement of the galley is designed to accommodate multiple crew working in the space and rivals that of much larger yachts. Crew quarters for three in twin berth cabin with ensuite head and private captain’s quarters with ensuite head.